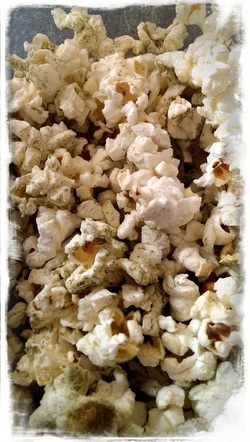 The key to making the spices stick to the popcorn is to make the spices into a fine powder. You can use a food processor but I used a coffee grinder and it worked perfectly. Put all the spices into the grinder and grind until it is a fine powder. 1. Put 1/4 cup of popcorn kernels into a small brown paper lunch bag. 2. Microwave for 2-3 minutes or until pops are more than 2-3 seconds apart. 3. While popcorn is still hot, put a layer in your bowl, spray with Braggs amino's (1-2 sprays) and then sprinkle seasonings on top. 4. Repeat until all of popcorn is sprayed and has a dusting of seasoning.